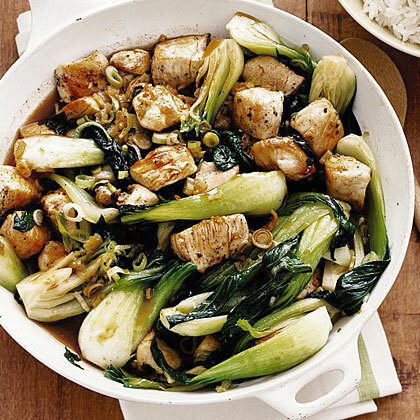 Stir-fried bok choy with chicken is among the easiest, yet flavorful preparations of Asian dishes that I like to cook. Bok choy pairs beautifully with almost any meat or fish, and if you don’t want to use meat, it is also exceptional on its own too! You can also swap out the bok choy for other greens including broccoli. Combined oyster sauce, soy sauce, rice vinegar, and sugar in a bowl. Set aside. Heat oil in a skillet, saute pan, or a wok over high heat for about 5 minutes. When it shimmers, add oil, garlic, and ginger. Stir for a few minutes and add the cubed chicken. Cook, stirring constantly until meat is cooked through for about 3 minutes. Add bok choy and stir-fry for 2 minutes. Add the sauce mixture, then cover it and allow to cook for 2 to 3 minutes more – this will cause the sauce to thicken and the flavours to be properly absorbed. You also want to make sure that the bok choy has softened nicely at its base. Remove from the pan and serve on a warm plate. Garnish with spring onions and enjoy!